You'll see a popup that shows all the teachers in your Kula. You can select particular teachers you want to ask to sub your class, or simply send the call out to everyone. Click "Send", and an email will go out with class specifics and a link for people to assign themselves as the teacher for the class. 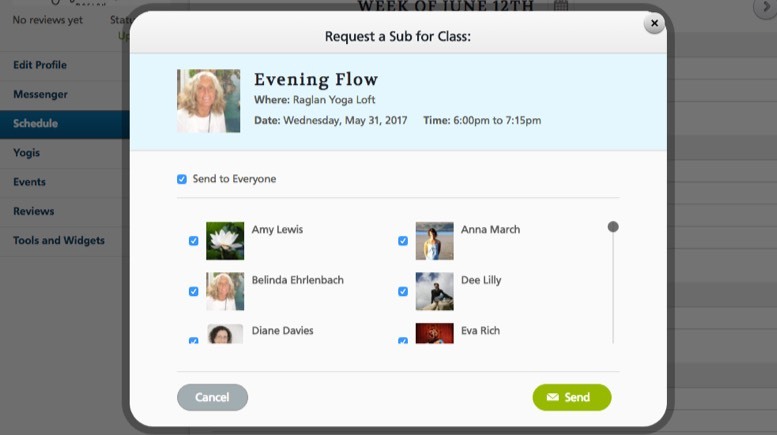 Teachers who have the YogaTrail Mobile App will get an instant notification on their phone. A teacher clicking their link will land on the class detail page and see a button to sub for the class. Once they click that, the class is longer available to be subbed by others (it's 1st come, 1st served). Your students, and the students of the substitute teacher, will be automatically notified that this class will have a sub! Of course you'll be notified (via email), too. "What's a Kula", you ask? For studios, it's simply the pool of teachers that are associated with your venue, who teach classes at your place. For yoga teachers, your Kula is your professional network of trusted yoga teacher friends. Subbing requests can only be sent to teachers in your Kula, so you should really add as many connections as you can. The association works both ways: for all the teachers in your Kula, you're also in theirs. Having a big Kula will increase the number of subbing job opportunities for YOU, too! Please make sure to click "Save" at the bottom after adding new teachers to your Kula! What if I change something about a class after requesting a sub for it? If you edit and change a class for which you've requested a sub, the sub request will become invalid (otherwise, people might sign up for something after getting the wrong information). If you change things about the class after a sub has already been assigned, you will need to make sure that you inform the subbing teacher somehow, if needed. What if I can't find a sub or nobody answers my call? When someone volunteers to sub your class, you'll get an email (or push notification on your phone). If you don't, it means nobody has stepped forward and you need to figure out a "Plan B" (cancel the class, or teach it yourself by juggling your commitments). 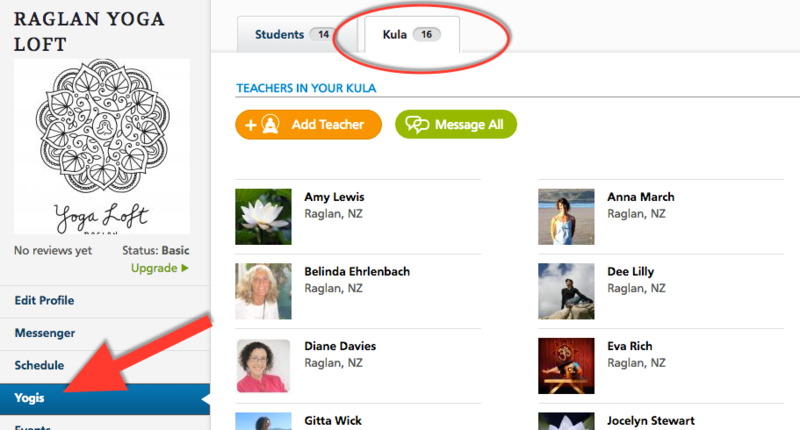 Having a large number of teachers in your Kula will help you to find subs when you need them! I'm subbing a class that's coming up - how do I indicate that on YogaTrail? Either the teacher who's normally teaching or the studio where the class is happening will need to send you a sub request with a special link for you to click. Send them a message and ask them to send you a subbing request for the class!